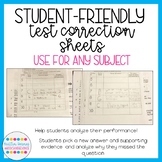 Students use this form to correct questions they missed on a test. They are required to explain why thy missed the problem and show how to get the correct answer. 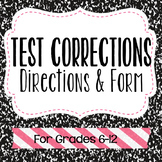 I use this form for students to do test corrections. It requires them to justify their answers, as well as explain why they got the answers wrong when they first took the assessment. Please remember to leave me feedback! I use this form to help guide my students in the proper way to correct a test. I was so tired of just having students circle a new answer and try to turn it in. This form breaks it down into rewriting the problem, reworking the problem, and then checking a box to identify the mistake they made. Students not only correct their answers but explain WHY each answer was wrong, and also show ALL work for how they got each new, correct answer. 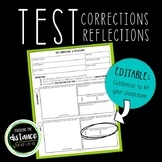 This includes a space for teacher name, test/assignment, and a parent signature (if needed). This is EDITABLE so that you can tweak it to your own uses! 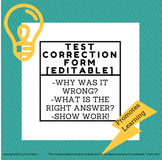 Test Correction Sheets: Help Students Correct and Analyze Their Mistakes! This is a sheet that I have students complete when correcting a math test. 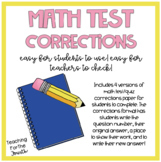 They show all work on the correction sheet and attach it to the test. This can also be used in other subject areas by changing the headers. A classroom mangement tool that can be used: improve student grades, differentiate learning, aid teacher grading, and continue the learning experience. It was originally written so that my students would realize that the learning of the subject matter does not end at the testing of the material. I use this sheet to assess students' understanding of math problems they miss on a test. They have to show their work and then explain how to solve the problem. 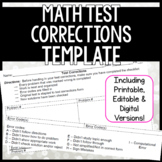 Could be use for test repair, but I choose to use it as a separate grade for math units. This is a great tool to clearly show students the guidelines for retakes and reassessments. It was designed for a science classroom, but could easily be modified for any content area.